Pergolas vs. Gazebos: Which One is Right for You? An outdoor shelter is a thing of beauty. In the dead of winter, pergolas are beautiful all covered in snow and twisted vines, but if you’d rather just enjoy them as they literally “spring” to life in the photos below, we can’t fault you for taking a moment’s pause to remind yourself that there is, literally, light at the end of winter’s dark tunnel. Let these airy structures transport you to warmer climes, and in the process, learn the difference between a pergola and a gazebo, so that you can start designing yours and get it built the moment the weather turns back around! Pergola: A pergola is basically a network of open beams sitting like a roof atop posts. 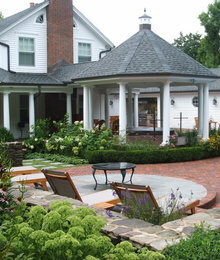 Their most common use is as an attractive deck accent or a covering for a walkway. While their structure is open and unprotected from the elements, they may still offer a bit of respite from the sun, and even from the rain if they’re fully covered by climbing plants. 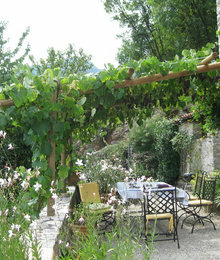 The lattice of wood beams makes them an ideal tether for climbing plants. Joining two of the most darling pool houses on Houzz is a pergola with a conventional structure of four columns topped by rafters placed at even intervals. The space carved out underneath is perfect for al fresco dining and is literally a central part of the overall symmetry of this characteristically Georgian design. Here, we can see the pergola’s modest shading benefits in action. I can imagine a patio covering like this working especially well in the American Southwest, where the sun burns hot and any bit of relief is welcome. Plus, the wooden shell offers ample joints upon which misting fans can be attached. It’s a win-win for Southwestern backyards. 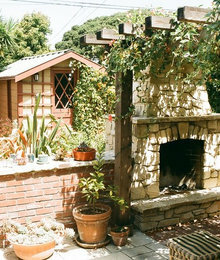 The word “pergola” actually derives from the Italian word “pergula,” which refers to a “projection from the roof.” No doubt, plenty of homes in temperate zones still employ the attached pergola for its practical advantages in filtering in what minimal winter sun is available, and blocking out the bleating rays during the summer via cooling shade plants that have been trained to climb the structure. 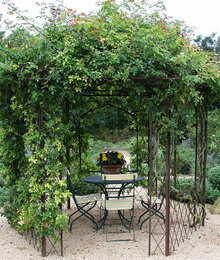 A prime example of a pergola covered in climbing plants, this structure evokes the romance of an Italian or English garden. Indeed, the pergola was adapted from its earliest historical use in 18th century English gardens, where they were known as “covert-walks.” Now, you’ll see pergola used for far more than just garden walkways. Perhaps the greatest asset that pergolas have to recommend them is its lack of obvious association with any particular architectural style or time period, since they’ve been used in so many different contexts. 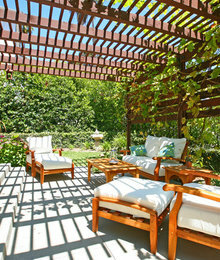 Pergola designers claim that there’s a pergola for every style, and I believe it. Gazebo: A gazebo is admittedly quite similar to a pergola and is probably the outdoor shelter whose name is most immediately familiar to us. 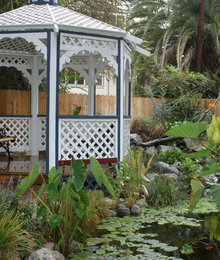 Its defining characteristics, and what generally separates it from the pergola, is its octagonal or circular shape and the fact that it usually has a true roof instead of open beams.These are all somewhat loose definitions, though, that serve the purposes of general classification but don’t always apply comfortably to all structures. This al fresco dining shelter, for example, is cylindrical like a gazebo, but its “roof"appears to have more in common with the pergola. Call it what you will, but you can’t lose if you simply show your landscape architect an image of what you want. 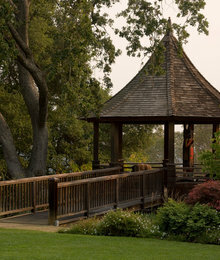 Gazebos can take on a host of stylistic fancies, from vaguely Asian like this San Francisco garden interlude with its steeply pitched spire, to Arts &amp; Crafts style with signature tapered columns. If the pergola can quietly assume its place within any style, a gazebo can determine the style of your whole landscape if you want it to. This one feels so ethereal and Japanese, I can only hope its owner carves out some regular yoga or meditation there. 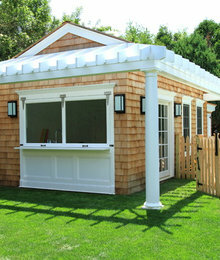 Similar to pergolas, gazebos can also be attached to the house. It’s a substantially more expensive endeavor, though. 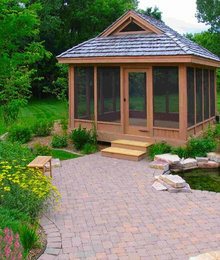 While neither structure has walls to speak of– only posts or columns– the gazebo demands the added expense of a true roof. Roofs are rarely cheap, especially when one roofline must be integrated with another. 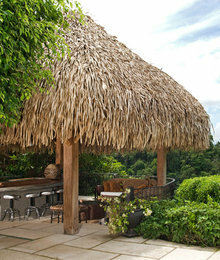 Still, for a customized outdoor retreat that is a true extension of the home, there can be nothing better. 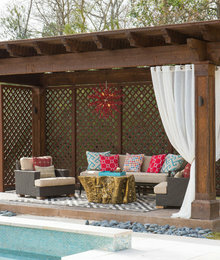 The clever designers at Crimson Design Associates created a sort of hybrid pergola-gazebo as a pool cabana. 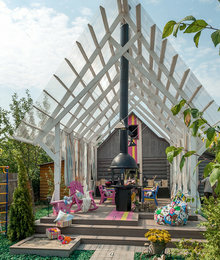 While the structure is unmistakably pergola-inspired with its stacked rafters, there is ultimately a roof made of bronze poly-carbonate, which, according to the designer, “allows light to come through but blocks out UV rays and keeps out the rain.” The addition of draperies and trellis panels insulate and intimate the space even more. 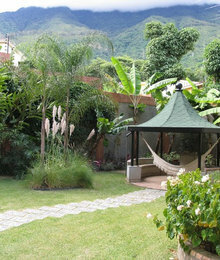 Nestled among tropical foliage in Venezuela’s capital city, this gazebo incorporates what appears to be concrete-cast seating that is integral to the structure. The posts are sunk into the concrete, bolstering them for use as tie-ups for the hammock. This gazebo seems to perfectly capture all the elements of a romantic’s dream: Frilly carved arches and delicate trellis panels ensconce the reveler in total peace as she sits at the bench with her book or easel. The most striking feature of this vignette is, of course, the view of a lily pond that would make Monet himself proud. I expect some debate over whether this really counts as a gazebo, but with screens instead of full walls, I think it’s a fine alternative for someone looking for just a bit more enclosure– especially in buggy locales. Finally, because I’ve always got to throw in a wildcard, there’s the Central American palapa: a thatched roof held down by four posts.